Looking for a good trail camera can be tough. You need to look into so many aspects and specifications before you find the one that you are looking for. You also need to determine if you want to focus on photos or videos, if you typically hunt during the day or night, if you need a rapid trigger speed, or if you can settle with an average performance and so many other factors. This product review will serve as a guide for your trail camera hunting so you can find the best camera for your trail hunting sessions. Continue reading this TEC.BEAN Game & Trail Hunting Camera Review to know more helpful information about this device. This TEC.BEAN Game & Trail Hunting Camera is perfect for outdoor use. It is waterproof, industrial grade dustproof, and a shockproof game camera that can support your extreme hunting activities. It functions best in environments that have a temperature between -30 and 120 degrees Fahrenheit with 20-85% relative humidity and non-condensing. This game and trail hunting camera are protected by a password so you can prevent theft or misappropriate usage. The password feature also prevents photos and video footages from being viewed when the game camera is stolen. It supports an anti-theft lock to add strength protection. You can purchase an anti-theft lock separately. 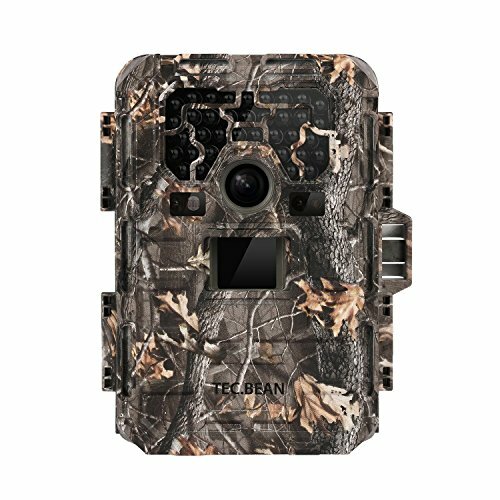 The TEC.BEAN Game & Trail Hunting Camera can be used for hunting and animal observation, for indoor and outdoor security surveillance, or for professional wildlife monitoring and researching. As with its specifications, it has a display screen of 2.0″ color viewer TFT LCD, and an image sensor with a 12.0 MP resolution and a memory SD card support up to 32GB. This game camera carries different languages including English, French, German, Swedish, Japanese, Czech, and Russian. Its picture size varies from 12MP with 4000×3000 to 2MP=1920×1080 in JPEG. On the other hand, its videos come in HD with a size of 920×1080 for 15fps to 1080×720 in 30fps (AVI). You can read more specifications here. The package content includes the trail camera, a USB cable, a TV out cable, a belt, a user manual, and a one-year warranty. Hunters appreciate good image quality and trigger speed. Coincidentally, this TEC.BEAN trail camera is known for its high resolution and fast trigger speed with 12MP high-quality full-color resolution and 1920x1080P HD video with audio record up to 90s. With its high trigger speed of 0.6-0.8S that can capture one to nine pictures per trigger, you surely would not miss any scene. It also has a long night vision range with 36 pieces of 940nm Black IR LED, which allows the game camera to take full-color photos or videos in the daytime, as well as black and white color photos at night up to 75 feet afar. As with videos, it can capture footages up to 10 feet in distance. The TEC.BEAN Game & Trail Hunting Camera has an Advanced Motion Detection Technology that is ideal for surveillance. It has five capture modes, including photo, video, time lapse, and hybrid (for camera and video). The Motion Detection has a proper mode for different observations. TEC.BEAN puts a high emphasis on high quality. So if you are not happy with your game camera or encounter some camera defects, you can avail the one-year warranty that comes with every purchase of the product. It has a compact size that is comfortable to set-up in any location. It is well packaged and easy to setup overall. Moreover, it produces an excellent resolution with the photos and videos. The small led screen allows positional setup and picture reviews to be smooth and easy. On the downside, consumers who have already tried this game camera found it a disadvantage that the batteries die after a few days of use. Hunters will love this game camera for its powerful features. It has many specifications that you can look into. It is widely used by many for surveillance, researching, or hunting, so it serves multiple purposes. For a high-priced trail and game camera, it is worth every cent.